Rumtek Dharma Chakra Center sprawls across 74 acres in the foothills the Himalayas is popularly know as Rumtek Monastery. 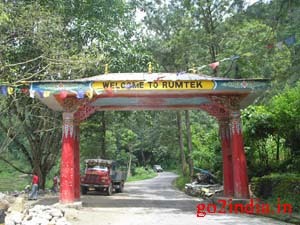 It is located at a distance of 24 Km and it takes nearly 45 minutes to reach from Gangtok city. On the way tourist take a short break at Shanti view point. From the parking place visitors has to climb up few meters to reach the main entrance. Vehicles are allowed for old and disable persons to go upto the main entrance. 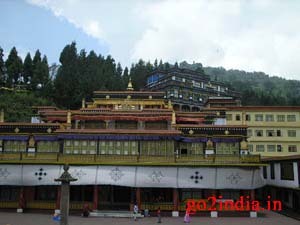 This Monastery built with modern construction material designed according to ancient Tibetan traditions. This monastery shares many similarities with the monastery at Tsurphu, Tibet. After the main entrance there is a big courtyard and many quarters surround this monastery for the monks and there is also a VIP gallery. Inside the complex at left side monks quarters are provided. In the main courtyard the famous Lama Dance ritual takes place. There are boards around this place asking visitors to maintain silence. There is color full traditional painting drawn in the walls of the main temple complex. Photo and video are allowed inside the Monastery complex but not allowed inside the main prayer halls. Visitors are allowed to go inside the main prayer hall. Within the Monastery complex one can find Golden Stupa and Karmae Shri Nalanda Institute for Higher Buddhist studies. The peace full atmosphere and presence of monks in their traditional dress gives a holly feeling in the minds of the visitors coming to this place.